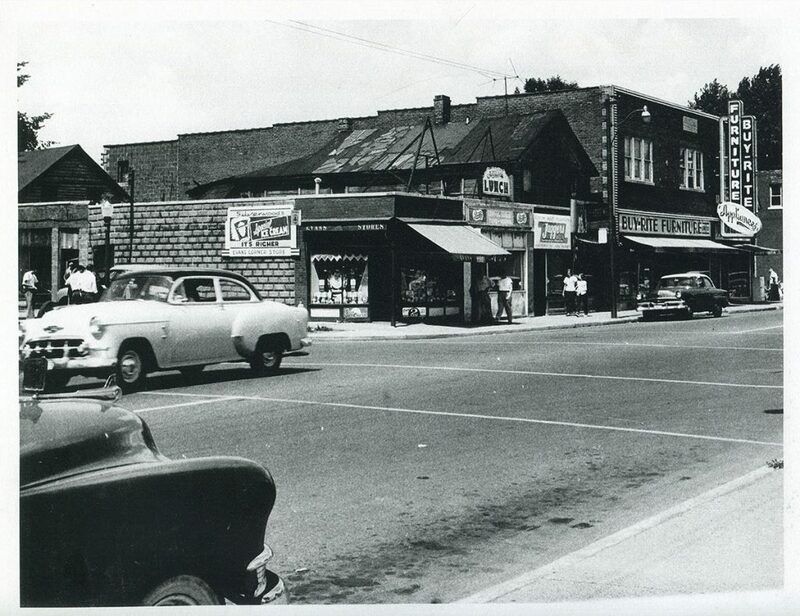 A shot from the late 1950’s looking east from Wyandotte & Langlois. Evan’s Store is on the corner. The 1955 directory lists it as Evan’s Drugstore No. 3, while the 1958 phone book simply lists Evan’s Store at 1000 Wyandotte St E.
The next few store fronts are listed as vacant in the 1955 directory. The larger building in this picture shown as Buy-Rite Furniture is still standing today as Hai Ho Oriental Furniture. The photo exposure makes it look much darker than the blonde brick that is actually on the building, but while it’s hard to see, the patterns in the brickwork on the facade match up.